One time, I got food poisoning while teaching. And I STAYED AT WORK. That’s right – even though all my co-workers told me to go home, I stayed. The students in my last class just *HAD* to do the activity I’d planned, so I needed to stay. I was clearly delusional. Yes, I made it through the last class. But I was so sick by that point that my MOTHER had to come to pick me up. My students told me later that I looked like I wanted to die (and I kinda did). My presence that day did nothing for my students. In fact, I may have scarred a few of them. But teachers do this all the time. Hopefully, not working through food poisoning, but not taking care of themselves. No one goes into teaching for the money. We go into education because we love kids. And we want the best for our students. And that often means going above and beyond all.the.time. That road leads to burn out, friends. It’s time to take care of yourself. 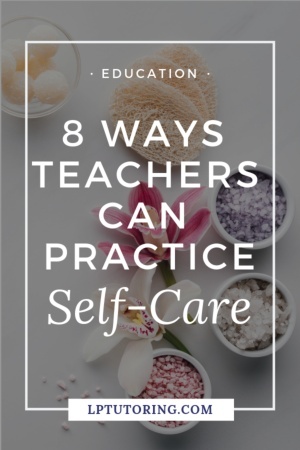 Teacher self-care isn’t selfish – it’s the best way you can refresh yourself to care for your students. Yes, I know that staying home is more work than actually going to school. Nevertheless, your body needs rest. Keeping germs from spreading to others is a bonus! And sometimes, you need a mental health day – just as valid. TeachersPayTeachers (TPT) has a lot of emergency lesson plans you can buy, download, and prep for that sudden illness. Most cost less than $10. Do it now before you get sick. It took attending grad school + teaching to make me realize I simply didn’t have enough time to grade everything the kids did. So, I stopped grading all the small daily assignments. Once I cut back on grading each assignment, the kids stopped asking and just did the work. I checked in on students during class, so I knew who was working and who was goofing off. (And the ones who weren’t working were in a world of hurt come test day.) When class ended, the assignment went into the student’s notebook. And I took way fewer papers home with me. And stop assigning homework over vacation breaks. You will thank yourself when you come back and have nothing to grade! When you get asked to sponsor the junior class (yikes, prom!) or chair a committee, learn to say a firm, “No, thanks.” You don’t have to explain. Just be polite and walk away. All those commitments take away from your time outside of school. For your own sake, you need to make personal time a priority. You know who I’m talking about – the disgruntled group of teachers that exist in every school. Wherever they eat lunch, just go the other way. If you’re lonely, start hunting for other teachers in their classrooms and see if they want to eat with you. Your body needs sleep so that you can function at your best. I know that high schools start too early and you have so.many.meetings after school. That’s why you stopped grading everything and said no to those requests. Use that extra time to sleep! I know, I know. It’s so hard to squeeze that extra time for exercise in. But your body needs to move. And physical exercise also improves your mental health and your sleep. Take the long route to the main office. Have a quick dance party in your classroom during your planning period (I did this a lot!) Park in the far spot in the parking lot. Take the stairs. These small actions all add up. I had a firm “no lunch meetings” rule with my students. It was the only time I got to talk to other adults. And I cherished every second of it. While that may not work for you, find a part of the school day that you spend with other adults who you like. The only reason I made it through my worst year of teaching was because of the other teachers around me. And chocolate. While this might mean a mani-pedi and massage for some, this might mean daily meditation for others. Find something that brings you peace and helps you to relax. 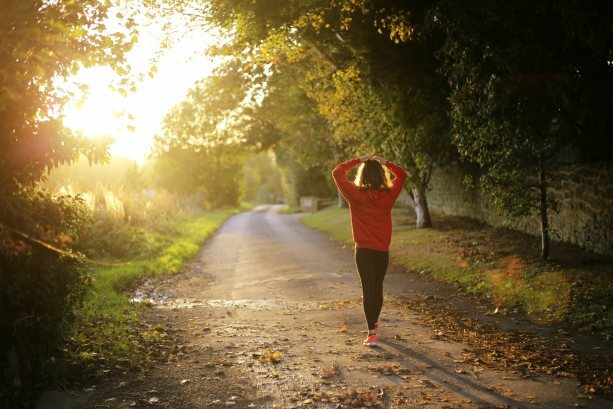 If you’re an introvert, you probably want time alone to recharge. Extroverts might want to find buddies for these activities. You do you. Here are some possible self-care activities to refresh yourself! 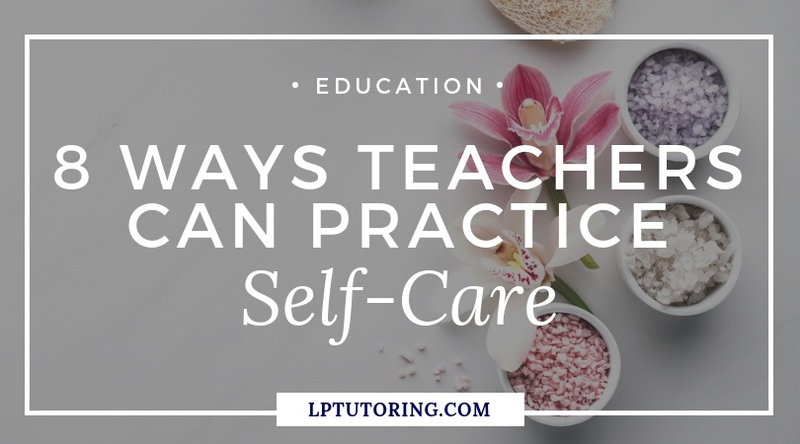 Hopefully, this list got you thinking about ways to practice self-care this school year! Only then can you help your students!